The Congressional fight over the SOPA and PIPA bills wasn’t a fight about whether intellectual property should be protected – virtually everyone agrees on this – but about how best to accomplish it. In fact, the most visible voices in the fight over SOPA/PIPA, on both sides, were people and industries with livelihoods based on creating or protecting intellectual property. But the substantive positions between proponents and opponents, and the implications of the legislation, were considerable nonetheless. For nonprofits, the implications were substantial even if they weren’t generally highlighted. Making service providers fully liable for copyright violations occurring anywhere on their networks would almost certainly lead them – Facebook, Twitter, YouTube, and other social engagement platforms among them – to aggressively censor information before it is ever posted, erring on the side of expansive and overreaching prohibitions rather than risk liability. And it gives repressive governments, well-heeled corporations, and others a substantially enhanced ability quickly to shut down web sites and entire domains, a power easily applied to silence online speech they dislike for whatever reason. For nonprofits involved in supporting democracy or human rights movements around the world, these provisions were especially troubling. Ethan Zuckerman and Joi Ito of the MIT Media Lab have a good blog post (“MIT Media Lab Opposes SOPA, PIPA“) explaining some of this. Opponents were able to take two very complex pieces of legislation and explain them in clear terms that spoke directly to the values and interests of their intended audiences. Tech people understood the implications of the DNS-blocking provisions, people whose livelihood depends on the ability to share information understood the implications of making social networking sites liable for copyright violations by people using the sites, and free-speech advocates understood the censorship implications. Opponents hit a critical mass, and their stories went viral, in part because everyone across key communities started talking about it about at the same time. Some of that was probably blind luck, but it was also because key opponents found ways to reach out aggressively across their networks more or less in unison. If you weren’t aware or engaged yet, but you were part of those networks, you heard about the issue a bunch of times within a short period, and then often you’d turn around and share the information with your networks, amplifying the viral effect. This was a real-time example of the “people have to hear something a dozen times before they notice it” marketing adage. Opponents, when reaching out to the not-yet-engaged, were able to offer a range of easy ways to express support. Calls to action included options like replacing your social networking profile photo with a “Stop SOPA” image, signing the national petition, adding your name to sign-on letters, and spreading the word about the blackouts by Wikipedia, Reddit, and others. Tons of individuals and individual companies created their own badges, images, and other easy-to-use tools. And many of these calls to action were themselves viral (or at least amplified the overall virality of the message). This was often organic … although there were people coordinating and collaborating (and some in prominent positions), there wasn’t, to my knowledge, a conventional campaign leadership team calling the shots, issuing assignments, and allocating resources. People across the networks felt empowered to contribute, and contribute they did. We often argue that narrowly focused outreach strategies can have more impact than untargeted outreach strategies. Efforts that depend on numbers alone typically don’t cut through the noise or they fail to offset more targeted strategies by the other side (“another day, another 5,000 emails from some nonprofit advocating for something”). The SOPA/PIPA fight illustrates an exception, however: if you can push the volume level high enough, even a strategy largely dependent on numbers can have a real impact. 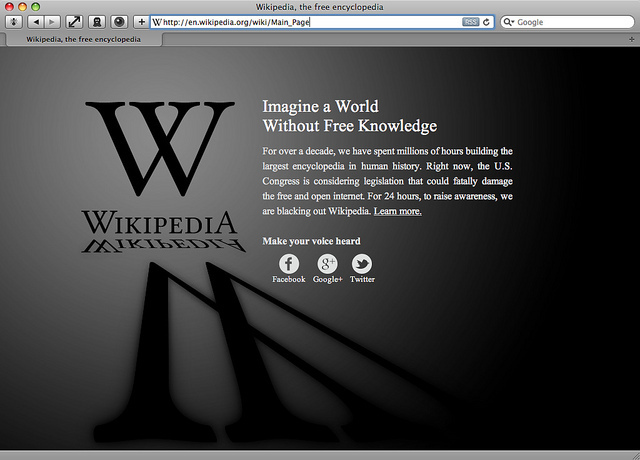 The number of news stories, the number of emails and phone calls received by legislators, the number of people signed on to the petition, the significance of Wikipedia blacking out … all of this resulted in a volume level that was impossible for legislators to ignore, and many flipped from supporting SOPA/PIPA to advocating for a slowdown or even opposing it altogether. And, lest this get lost in the excitement of a quickly organized large-scale national campaign, it looks like concrete stories from real individuals who would be directly impacted by SOPA/PIPA were also really important to persuading legislators to shift their positions. The high volume efforts got their attention, but the legislators and staff I spoke with wanted to know – in very tangible terms – what the legislation would actually mean in specific instances for real people and real businesses. The large-scale outreach work created space, but from here it looks like the concrete stories were essential for closing the deal. Although I don’t think the SOPA/PIPA fight is necessarily a good model for every advocacy campaign, it’s not difficult to predict that the so-called “internet community” will become increasingly political and increasingly sophisticated. There are plenty of lessons from this fight for other advocacy efforts, and lots of opportunity to collaborate with other constituencies as well as watch and learn as online advocacy strategies mature. MacWorld just posted a interesting analysis, and we’d love to hear about the best analyses you’ve come across. We’d also love to hear your thoughts on the lessons to learn from the SOPA/PIPA fight.